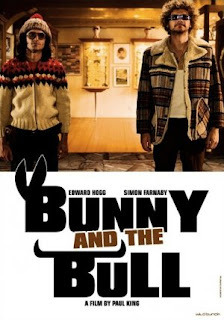 Finally, I am pleased to announce the best movie of 2011 - or I would have, except that BUNNY AND THE BULL came out in Great Britain in 2009; it's just taken two years to arrive in Cleveland. So forget it. I think I've even seen it on the DVD racks. I mean, Cleveland's media was still predicting LeBron would stay here when BUNNY AND THE BULL premiered, that's how far back it goes. If there's any consolation, I'm informed that cool things take even longer to reach Buffalo, New York. And then some hater informed me that it takes a week after that for Rochester. Even if they're the pits, I should move to Buffalo/Rochester and get rich selling a load of my old Windows 95 PCs. Anyway, point is that BUNNY AND THE BULL is one of the few makes-me-want-to-grab-strangers-off-the-street-and-make-them-see-it pictures to come my way the last 12 months (and I don't grab strangers off the street and make them see anything; leads to arrests and sexual-predator registration these days). The feature, a multimedia blend of CGI, stop motion, live-action and line art, is something that could only be rendered in the cinema (then again, same could be said of GNOMEO AND JULIET). It's the work of the UK's Paul King, whom I understand brought a similar multimedia-surrealism to a cult British sci-fi sitcom-thing called "The Mighty Boosh" (spelling not counting), and viewers on this side of the Atlantic might note a resemblance to Michel Gondry's THE SCIENCE OF SLEEP, maybe via Jeunet and Caro. The tragicomedy begins with the obsessive-compulsive daily routine of Steven (Edward Hogge), a neatnik neurotic who has spent a whole year indoors, shattered after some kind of trauma. When mice devour his carefully cached instant-vegetarian meal supply, Steven must at last interact with the outside world by phoning a kitschy international fast-food seafood chain for delivery, an act that triggers a cascade of memories about how he got to this sorry state. A year earlier Steven was a lonely guy pining for one of the few girls ever to ever pay attention to him (oh, so dude must be a movie critic; I wondered what these characters did for a living). His unctuous best friend Bunny (Simon Farnaby), a wild-haired roue and habitual gambler, tells Steven that, since no female in England is interested, the best way to get Steven laid will be to embark on a European jaunt, and Bunny knows just the right horse on which to bet to get the money (for those of you who have never been to London, there are storefront wagering parlors on every block and have been for ages. Cleveland will get there soon. And later on, Buffalo). Incredibly, the long-shot horse wins, and the odd-couple twosome take off on a crazy, impulsive trek that goes through Switzerland, Germany and Spain - with Steven dragging Bunny to odd places like a Museum of Cutlery, until Bunny rebels and resumes his regular routine of drunken gambling and womanizing. A pretty young Spanish waitress Bunny picks up in a Polish seafood shack hitches a ride with the two blokes, and gives Bunny (in addition to numerous sexual escapades) the idea to fight a bull in her hometown. Meanwhile Steven starts to develop strong feelings for the girl... All leading up to whatever event it was that has kept Steven homebound ever since.